Assistant Professor Artem Chernikov has won a 2017 Faculty Early Career Development (CAREER) award from the National Science Foundation. CAREER awards are the NSF's most prestigious award in support of early-career faculty who have the potential to serve as academic role models in research and education and to become leaders in their field. Associate Professor Emeritus Rodolfo (Rudy) Vittorio De Sapio passed away on January 24, 2017 due to complications arising from cancer of the bladder. Rudy joined the UCLA Department of Mathematics in 1966. Throughout the years, he grew a reputation for being one of the best teachers in the department. The hit Disney movie "Moana" features stunning visual effects, including the animation of water to such a degree that it becomes a distinct character in the film. In Memoriam: Philip C. Curtis Jr. The UCLA Department of Mathematics lost a cherished and distinguished member of its faculty with the passing away on December 19, 2016, of Professor Emeritus Philip C. Curtis Jr.
Click here to download a PDF version of the 2016 newsletter. Requires Adobe Acrobat Reader to access. 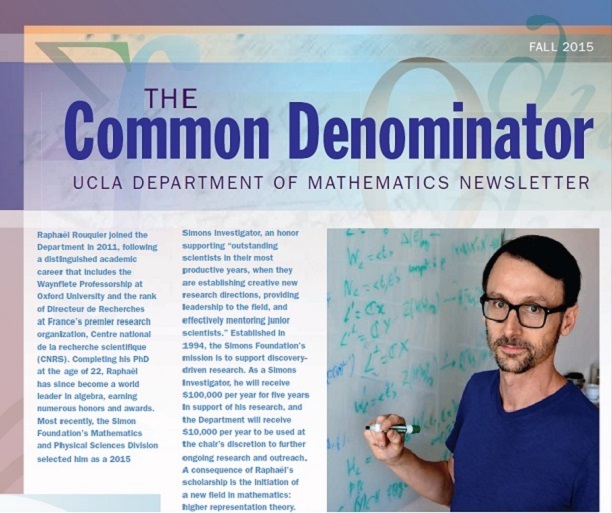 To find the newsletter archive, please visit: https://www.math.ucla.edu/newsletter-archive.